The hotel is near to the beach, has a pool with water slides but only 1 allowed to be used due to being built by an overhead cable. Restaurant and food were of a reasonable quality. Rooms recently refurbished but still not fully completed at time of holiday. All Inclusive bar closes 1200 midnight, service very slow and only 1 or 2 staff serving. Reception staff were on most part very busy doing other things at same time as checking you in so led to lengthy check in times. There are some mobility issues due to location which I do not recall being pointed out when booking and had not previously seen the holiday in a brochure. That said the hotel is at the top of a hill accessed in all directions by an incline of varying length/steepness. The main entrance is at the top of approx 200mtr hill (cardiac hill) which rises at about 15% gradient initially rising to about 20% for last 30mtres which can be rather daunting if you have heart/breathing/arthritic problems, I personally thought that this hill was not nearly as bad as the one to access the second floor reception which was twice the distance (and steeper) but I did try both and I am quite overweight and have mild asthma and was walking with a painful ankle, to give you some idea I have posted photos of all inclines on other sites as well. The hotel is part of Amigos chain which in total includes about 10 hotels/apartments/campsites on all inclusive basis, however when we were there (March 14th-21st) there was only 4 properties accessible due to renovations etc. There is a free inter property transfer bus which runs 6 times a day up until about 5.30pm which can be used to travel between various hotels if you wish to have a change of scene, sadly not suitable for most disabled people due to high steps onto bus. The hotel is well laid out set in a prehistoric cave theme, most areas appeared easily accessible via 6 small lifts at both ends of building although 3 lifts nearest to restaurant /second floor reception are not in best condition and were quite temperamental at times, there is also a lift from street level (up a side path) to reception at main entrance if you are shattered after climbing cardiac hill but you do have to walk through a smoking area which incorporates the reception bar/after midnight self service bar to get through to reception desk area (this was initiated mid way through our holiday much to our annoyance). Avoid this hotel. On arrival the receptionist served us while constantly answering the phone which made check in difficult as we had 5 rooms to sort out. If you want a good nights sleep don't go here as you can hear everything through the walls!! Even someone tinkling in the toilet! The queues for the bar were always long, average waiting time for a drink was 20 minutes. The bar was always short of staff and one night they ran out of glasses to serve drinks in! In all the other magic hotels they had the all inclusive bar open all day but in our hotel it was only open midnight to 8am. Good points - the food was excellent and you can use the facilities at any of the other magic hotels in benidorm (i.e. pool, bar, restaurants). We read a lot of the reviews before hand and were particularly worried as we previously stayed in their sister hotel Tropicanna suites (nightmare holiday)Upon arrival we were given a glass of sparkling wine, we couldn't check in until 14.30 but were given our all inclusive cards so we could have lunch. All the meals were fine, in fact better than fine for a 3*. The room was comfortable and the maid came in everyday. The only 'downside' (good pun here) was 'cardiac' hill. This you do get used to after the first few days. All the staff were very friendly, the entertainment was a bit hit and miss, but Benidorm town centre is full of entertainment. The upside was when you got back from the town at 2 a.m the A.I alcholic drinks were still available via a self service optics in reception. All in all we had a good holiday at a very reasonable price. Thanks Magic Rock for a good holiday - watch out animation team - we will be back! when we got to the resort,it was pouring with rain.we were made to walk up the famous cardiac hill with our cases whilst getting wet. the hill does get easier as the holiday goes on,i dont know how people with kids or disabilties cope with it? i have stayed at alot of all inclusive hotels in europe and the caribbean and this is the worst one ive visted no way a 3* or thomsons 4 t's !!!!!!!! the rooms are basic and not very clean and no balconys or terraces. the food is the same every day bland and cold. there was only one bar open for the day and eveing with one person serving drinks,with the result of having to wait to be served for at least 20mins,the drinks were weak to say the least.in one eveing i drunk 12 tia maria and cola and was as sober as when i started the eveing.the hotel gave a reason for one bar being open they didnt have the staff,next to this bar was a help your self bar that opens after 12am,a few of us asked the rep if it was possible to open this to take the pressure off the bar staff,she said she would ask the managment, that was the last we heard. the resort is lovley, great bars etc and the beach is clean. this was my 3rd time to benidorm and i have allways stayed in self catering i wish i had done the same this time i might have saved some money. if you want a great all inclusive hotel dont vist this one. even if it is cheap!!!! !its still not worth the money. Sorry for the bad start but you will understand why when you visit. As other people have noted on this site the hotel is located very close to the beach but at the top of whats called 'cardiac hill' this was the first of our problems due to huge road works ongoing outside the hotel. The bus will drop you off about 800 meters away and just point and say 'that way', so you and your family (in our case 4 kids, 6 cases and our daughter in a wheelchair with a broken leg) will have to climb this hill to reach your hotel. you can't check in until after 2.30pm so as we arrived at 9am we had to change in a already full to bursting 'case safe room'. when we eventually had our room we found it to be very basic with cheap mdf furniture which was all swollen and damaged. At the moment they are 'hacking off' tiles and doing very noisy work on the family salon (will effect rooms 201-08, and 301-08) this work starts at 8am until 5pm so the room is very noisy (the hotel staff lied and will not own up to this as they blame the road works, i followed a worker into the room and filmed them working and they still would not admit they were causing the noise). don't expect a rest full time by the pool unless the sound of a jack hammers and diggers are soothing to you. the drinks are OK but water is not free as advertised in booklet, oh and as there were 6 in our party when i went to the bar for 6 drinks each drink had to be bought per 'swipe card', so it takes ages and Que can can build up quickly. 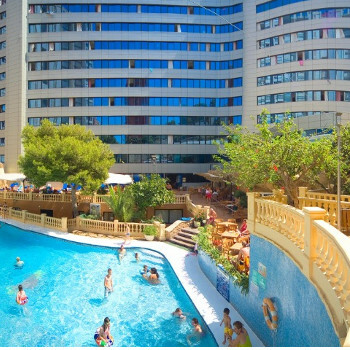 on a positive side you can use the other hotels in the group for drinks and food (6 in benidorm), its right by the beach front (800m) and the buses stop at the bottom of the road. Good luck to all who are brave enough..
stayed at one of there sister hotels magic tropicana gardens with mum and son. had a fantastic time met great people who we keep in touch with staff quiet friendly apart from the janitor who was a perv ha ha . first time in benidorm and it will be the last hotel a death trap glasses left lying about pool..no lifeguards.. Broken glass in kids pool..never seen the poolside ever getting cleaned ..1 bar allways busy 20min wait for drinks rooms dingey missed not having a balcony.one good thing was the dining room food brilliant.They also had a food area on poolside which never looked clean the staff just looked miserable not very polite.Building work next to hotel thomsons never told us about so you can imagine the noise on the poolside. This is a bit of a long winded review but I am telling it as it happened and to inform people that may be thinking of booking this hotel for a family stay that it may not be the perfect choice. My partner and I have just returned from Magic Rock Gardens after a week's stay.